Customs and police officers have busted a gang smuggling in marijuana from the U.S. to Ho Chi Minh City. 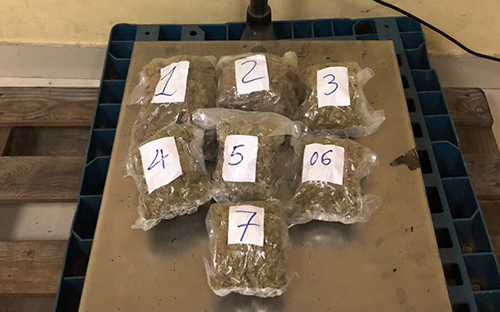 On Sunday, customs officers at Tan Son Nhat airport and drug police officers from the Ministry of Public Security found six kilograms of marijuana hidden in confectionery sent from California and Philadelphia to three people in HCMC and one in the central province of Binh Dinh. The four suspects, aged between 19 and 51, were taken in for questioning. So far this year customs officers at the country’s largest airport have caught 60 kg of marijuana sent from the U.S. in more than 40 consignments. Last June they had found four kilograms of marijuana hidden in confectionery sent from California to an unnamed man in Hanoi. They said drug trafficking gangs have begun to use airlines and express services to send narcotics to HCMC and neighboring provinces. The anti-drug police are working with customs to crack down on this. Vietnam has tough drug laws. Those smuggling five kilograms of marijuana resin or 75 kilograms of marijuana leaves can be sentenced to death. The possessing or smuggling more than 600 grams of heroin or more than 2.5 kilograms of methamphetamines are also punishable by death.